I don’t remember the 1992 Barcelona Olympics very well. In fact, they are the Olympics I’ve watched the least since my first vivid memories of watching the 1972 Munich Olympics. This was not due to any loss of interest, but rather that I was busy working 80+ hours a week trying to get my PhD thesis written by the 3rd week of August of that year. The 1992 Olympics took place from the 25th of July through to the 9th of August, and that whole period is just a blur in my life, all I remember seeing was my office and computer screen. However, I do remember a few things amidst the haze. The lighting of the Olympic flame by archer Antonio Rebollo shooting an arrow into the cauldron was certainly a highlight. Another memory was Linford Christie winning the 100m Gold medal. Christie had come 3rd in the 1988 Olympics 100m, and was then elevated to Silver when Ben Johnson was disqualified. In 1992, Christie was at the peak of his form, and won in 9.96s, with Frankie Fredericks of Namibia coming 2nd and Dennis Mitchell of the USA getting 3rd. Christie still holds the UK national record for 100m, which he set in 1993. 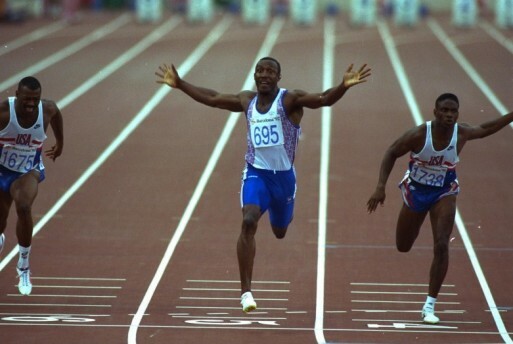 Linford Christie winning the 100m at the 1992 Barcelona Olympics. For me, the most moving memory from the 1992 Barcelona Olympics was the sight of Derek Redmond being helped across the line in the 400m. Whilst running down the back straight, Redmond tore his hamstring muscle, but decided to limp on to finish the race. As he entered the home straight, his father came out to help him over the last 100 metres. Redmond dissolved into tears on the shoulder of his father, and there wasn’t a dry eye in the stadium. 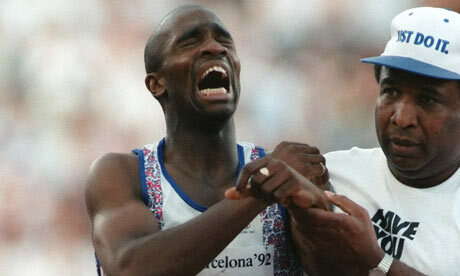 Derek Redmond in tears as his father helps him over the last 100m of the 400m final, during which he tore his hamstring. What is your memory of the 1992 Barcelona Olympics?